This ELISA detects unnatural constructs of Protein A, such as the MabSelect SuRe™ ligand sold by GE Healthcare. Use this kit if you are using a recombinant form of Protein A with significant structural differences from natural Protein A such as MabSelect SuRe™. Four newer Protein A assays known as Mix-N-Go™ methods are also available. These methods replace the sample boiling and centrifugation steps with a special sample treatment reagent that allows accurate detection of Protein A in the presence of your sample antibody. The Protein A Mix-N-Go™ kit (F610) uses standards calibrated to unnatural constructs of Protein A such as GE Healthcare's MabSelect SuRe™. The Protein A Mix-N-Go™ kit (F600) uses standards calibrated against natural and conserved recombinant forms of Protein A. The LOD for this F400 kit is ~50 pg/ml. 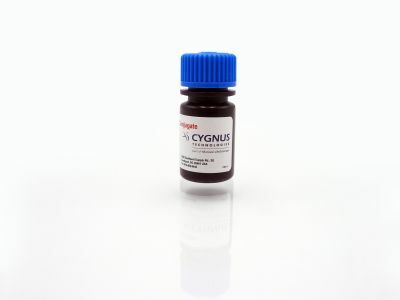 Which Cygnus Protein A ELISA kit to use: F050, F050H, F400, F400Z, F600 or F610? 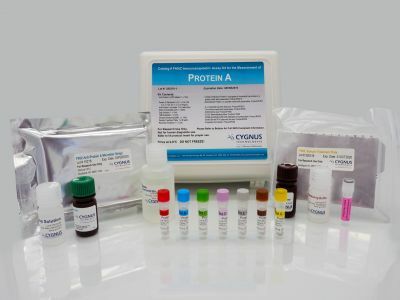 Cygnus Technologies now offers several ELISA kits for detection of natural Protein A as well as most modified recombinant constructs. Our original kits, Catalog F050 and F050H have proven to be valid for use in detecting both natural and structurally conserved recombinant Protein A. Catalog F400 and F400Z kits were offered to better detect unnatural recombinant constructs of Protein A such as GE Healthcare’s MabSelect SuRe™ ligand. In addition, we offer kits to other unnatural constructs. For first time users we recommend trying our F600 or F610 kits as these are the most robust and easy to use kits on the market. The F600 and F610 kits utilize a proprietary Mix-N-Go™ protocol that eliminates the heating and centrifugation steps. These assays use the same antibodies as our F400 and F400Z kits. The F600 uses standards calibrated to natural and conserved Protein A, while the F610 uses standards calibrated to unnatural constructs such as MabSelect SuRe™. The simple sample dilution step employed in these kits overcomes the product antibody interference seen in other methods and as such has been successfully validated for a large number of therapeutic antibodies. The Cygnus Protein A Kits, Catalog F050 and F050H use antibodies made to natural Protein A with qualification performed against only the natural and the highly conserved recombinant Protein A. With the introduction of MabSelect SuRe™ we have evaluated its reactivity in these kits. Our data has shown that it has only about a 20% weight to weight reactivity relative to the Protein A standards in these kits. This 20% reactivity may be greater or less depending upon other factors such as the product antibody being purified, which may contribute to further interference or non-specificity. The F400 and F400Z assays address the low reactivity to MabSelect SuRe™ seen in our other kits, while incorporating several other improvements in the methodology. The biotinylated antibody used in our original kits has been replaced with a different antibody directly labeled with HRP. Improvements include more sensitivity, simplified assay protocol, more standards, and less probability of product matrix interference. The F400 and F400Z kits detect natural, conserved recombinant, and MabSelect SuRe™ Protein A ligands essentially 1:1. Similar to the F050H assay, these assays use a sample denaturation step to overcome sample/product antibody interferences. The F400Z kit uses the same antibodies, standards and sample treatment procedure as the F400 kit. The only difference is that F400Z has a "recovery enhancer" reagent that improves analytical recovery in antibody: fusion proteins and antibody fragments that are not completely removed during the sample treatment step.